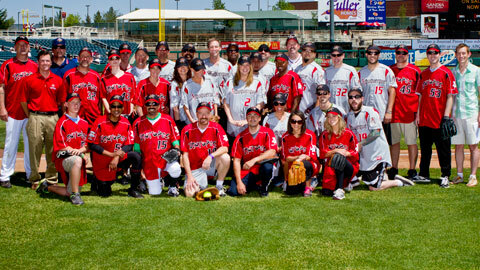 Over 30 celebs took part in the Isotopes' celebrity softball game benefiting YDI. The Albuquerque Isotopes' first celebrity softball game turned out to an immense hit, as around 30 celebrities ended up raising $10,000 for YDI in Albuquerque. Billed as "Breaking Bad" vs. "In Plain Sight," the game featured actors from those two shows as well as others shooting projects in the area, such as Cobie Smulders from "How I Met Your Mother," and even local luminaries like Mayor of Albuquerque Richard J. Berry. Team "Breaking Bad" was managed by three-time Emmy Award winner Bryan Cranston, while the "In Plain Sight" side was helmed by the star of that program Mary McCormack. In the end, it was McCormack who ended up pulling all the right strings, leading the "In Plain Sight" team to an exciting 5-4 win.